We replaced the existing single drawer at left with a three drawer cabinet. We also fabricated a new solid surface counter top with an under-mount sink. The drawer unit was stained and finished to match the existing cabinets. Solid cherry raised panel doors and cabinet custom made to match the existing style. Maple veneer plywood with clear finish. Solid surface top with under-mount stainless sink and maple veneer plywood apron. Note the double layer of build up at the sink and front counter edge. This gives a more robust look. Most tops are only built up at the front. 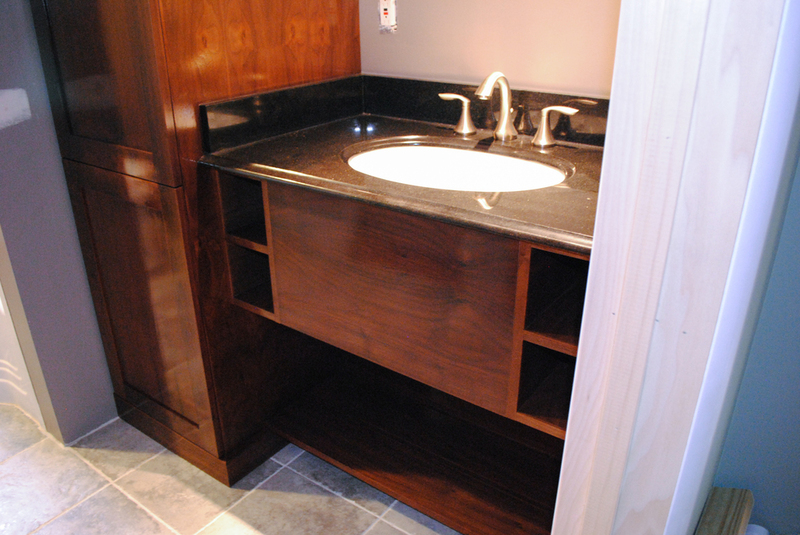 Custom cabinet, vanity, and trim in walnut veneer plywood. Doors are solid stile & rail construction with 1/2" walnut ply panels. The counter was provided & installed by the homeowner. Solid surface counter top and base cabinet made to match existing oak cabinetry.